This book is a celebration of diverse community, the power of multi-generational connections, and friendship across racial lines. It also recognizes that loss is real but also surmountable. What a beautiful story! Miss Eula is back! In this heartwarming companion to Chicken Sunday, young Trisha is devastated when her grandmother passes away, but finds joy in bonds with a new friend, her new California neighborhood—and the invincible Miss Eula. There will never be anyone like her grandmother, Patricia Polacco thinks, when her grandmother passes away. But when she and her family move to California—in the middle of a drought—she meets a new friend, the irrepressible Stewart, and his amazing grandmother, Miss Eula, who not only takes Trisha under her wing, but, with Trisha and Stewart, steps up to lead their entire extraordinarily diverse neighborhood to help a hurting neighbor—and her once lush garden—survive the drought. 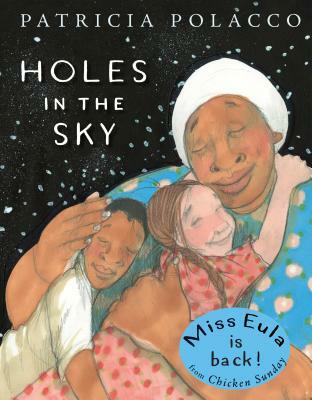 Trisha's grandmother's old saying about the stars being Holes in the Sky turns out to be Miss Eula's, too, convincing Trisha that she has miraculously discovered another unforgettable grandmother.